It printed fine stationery for maharajas and gold-emblazoned address books for Katharine Hepburn. Its leather goods and travel accessories found their way into the homes of Grace Kelly and Vivien Leigh. It still makes Queen Elizabeth II's yearly planning calendar. It's been a renowned British brand since 1887. And chances are you've never heard of it. The brand is Smythson (pronounced "smithe-sin"), and if all goes according to plan, the name is about to become a lot more familiar to you. After generations as a Bond Street institution—and after 15 years with a tiny Manhattan location as its only U.S. outpost—Smythson is set to grow its presence stateside, with eight new stores slated for markets including New York and Los Angeles over the next two and a half years. (Scroll to the bottom of this story for photos of Smythson goods, present and past.) "We have never stepped up and said, we're going to do this in the U.S.," explained CEO Mark Daley, who happens to be American. "Now we are." Smythson will have plenty of competition in the luxury sector, to be sure. But Daley believes his company has an edge, in part because Smythson doesn't actually see itself as a mainstream luxury brand. "We're very comfortable being who we are," he said. "We're not throwing logos in your face—we don't believe in that. We believe in quality and aesthetic and texture." The executive is referring to Smythson's unapologetically simple designs—goods that are handmade from soft leathers in muted colors, free of baubles or flashy monograms. Ironically, it is Smythson's refusal to command attention that has won it much of the attention it enjoys today. As Stellene Volandes, style director of Town & Country magazine, points out, even before Smythson opened its tiny shop on 57th Street, its unassuming profile was part of its mystique. "There was this allure because not everyone knew how to pronounce the name," she said. "As far as luxury goes, being someone's best-kept secret is key." Daley insisted Smythson will continue to maintain a low profile. "Our job is to get people curious about the brand, rather than a splashy, gigantic marketing campaign," he said. Yet, its expansion plan will involve some degree of promotion. The company has hired a social media manager, is working with several influential bloggers and is revamping its website. Even as it embraces digital marketing tactics, it is Smythson's proudly analog history that will remain its most effective differentiator. Daley has delved into the archives to assemble pieces from the brand's storied past—a Bond Street bag from 1900, an original featherweight diary from 1908. These and other items will be displayed in stores for a limited run. It is smart for Smythson to play up its legacy, especially as it chases younger consumers, said Jason Cohen, chief creative officer at the luxury branding agency The O Group. "There's an interesting opportunity for brands like this to connect with consumers," he said. "A highly regarded heritage is a really appealing message for millennials, who are always on the lookout for authenticity." And at a time when many luxury brands are becoming mass, authenticity can be a key selling point—especially when selling to the type of consumer who's impressed that Claudette Colbert and Winston Churchill once favored Smythson products. "We're one of the true British heritage brands," Daley said. "I think an American audience will appreciate that." CEO Mark Daley said he doesn't want to get involved with the race to make an "it" bag. Instead, Smythson handcrafts simple, classic bags that are deliberately low key. Popular with travelers, Smythson continues to make a variety of accessories useful to jet-setting customers, including backpacks, watch rolls and currency cases. Since its founding days, Smythson has been known for its unusual (and often custom-made) creations such as backgammon boards and croquet sets. Jewelry boxes are another old-world item, but Smythson still makes an entire collection of them. Smythson's stationery—much of it hand engraved on copper plates and then stamped on milled paper—was famous in the U.K. It also worked as the company advertising. This store invitation promises "stationery & fancy articles of a high-class character." In the early 1900s, Smythson's clients included Indian maharajas, who whom the company made this stationery complete with gold monograms and mother-of-pearl inlay. Smythson still makes custom stationery, though perhaps not quite this elaborate. Smythson's catalog can be found online now, but in 1902, this one appeared along with an endorsement from the Queen, who referred to the Smythson store as "quite an emporium of charming and useful souvenirs." Along with the likes of Grace Kelly and Vivien Leigh, silver screen legend Katharine Hepburn was a regular Smythson customer. Hepburn bought notebooks and custom-made address books like the one above, which featured her initials on the lower right corner. Today, every luxury brand makes a commodious carryall. 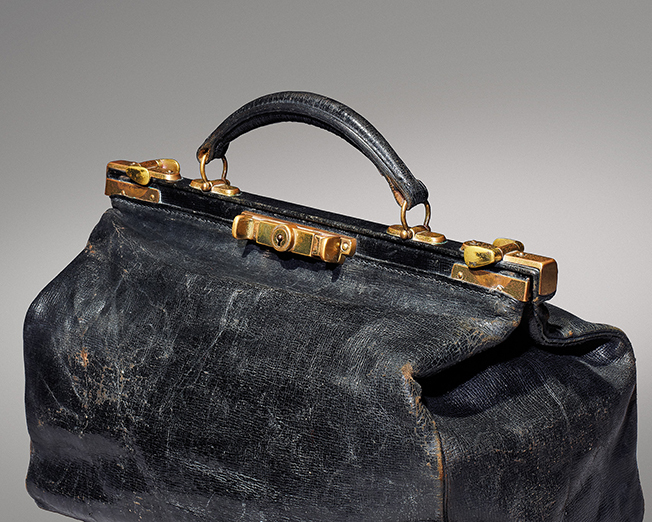 But 116 years ago, Smythson was among the first to offer a smart but durable kit that could "always hold just a little more," to quote the company literature. This story first appeared in the Feb. 15 issue of Adweek magazine. Click here to subscribe.